400 Grams Fresh Seafood Mariner (should be available in Deli section in Supermarket) otherwise can use Prawns, Mussels etc. Heat the 3 tablespoons oil in a deep pan or Wok. When hot add chopped garlic and fry slightly. Add the chopped ginger and chopped green chillies and continue frying for a minute. Add the chopped onions and 1 tsp of salt. The salt will bring out the moisture in the onions and quicken the frying process. When the onion in the mixture has lost its rawness, add chopped curry leaves and fry well till slightly brown. Now add the powders, mix well and add chopped tomatoes. 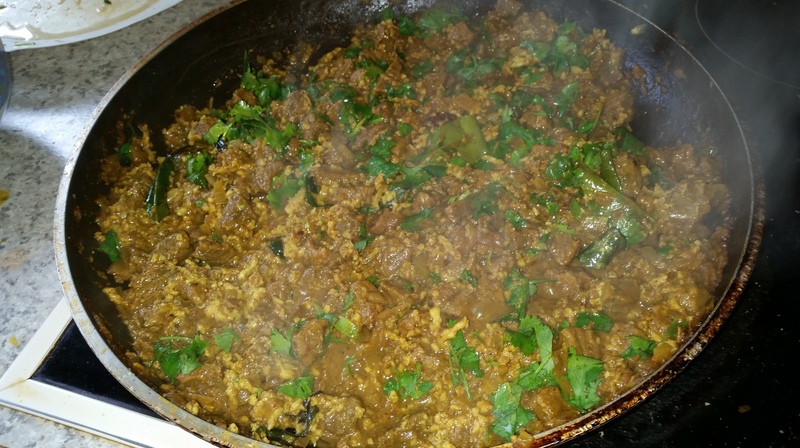 Mix and allow cooking for 3 minutes, adding the chopped coriander leaves, mixing and cooking for another 3 minutes. Add water if required (if the mixture dries up). Add the Seafood Mariner and mix well. Cook for 3 to 5 minutes (according to your flame-Gas cooks faster). Do not overcook (the squid and mussels will become rubbery). Check for salt (though not required) and if you want it to be more sour, add vinegar to taste (one tomato makes it sufficiently sour). If you want slight gravy add little water. Turn the flame off and allow cooking further in its own heat. Cut the beef into small pieces and boil the meat with a little salt, 1 tsp pepper powder, ½ tsp turmeric powder. Heat a tablespoon oil in a pan and fry 4 tablespoons of the ground masala. Add the scraped coconut and fry till you get the fried coconut aroma. Remove the coconut. Heat two tablespoons oil and fry the chopped onion. When brown add the curry leaves and fry for a minute. Add the ground masala and fry till dry. Add the masala water and again fry till nearly dry. Now add boiled beef pieces and fry till they are coated with the masala. Now add the boiled meat water, vinegar and allow to cook till the meat is nearly dry. Check for salt and vinegar- add if required. Add the fried scraped coconut and mix well. 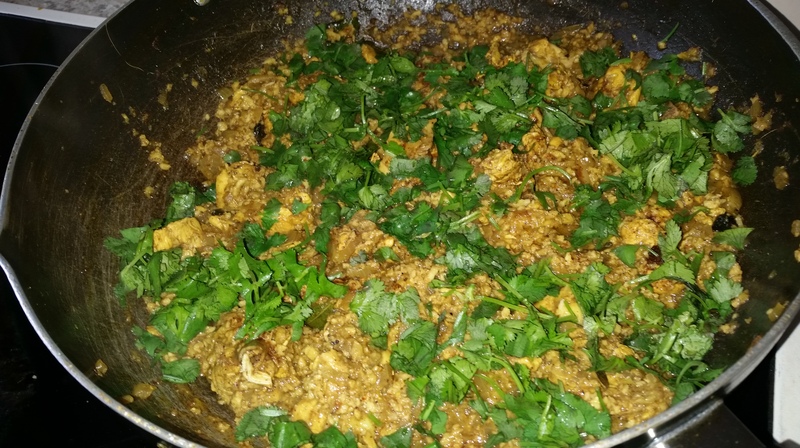 Add garam masala and finally add chopped coriander leaves. Mix and remove from flame. Cut chicken into small pieces, wash well and boil the pieces with a little salt, 1 tsp pepper powder, ½ tsp turmeric powder. Don’t add water or a little water if required. Heat two tablespoons oil and fry the chopped onion. When brown add the curry leaves and fry for a minute. Add the ground masala and fry till dry. Add the masala water and again fry till nearly dry. Now add boiled chicken pieces and fry till they are coated with the masala. Now add the boiled meat water, vinegar and allow to cook till the meat is nearly dry.